If you have a desire to release God’s creativity in you through art, then join this brand new Encourager Group. This class is for all painting skills levels, ages 15 and up, and registration is only $20. You’ll enjoy a fun, creative, and encouraging environment all while painting with oils or acrylics. 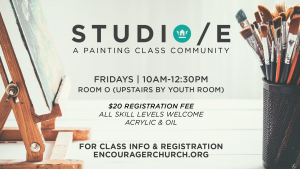 You’ll enjoy a fun, creative, and encouraging environment all while painting with oils or acrylics. 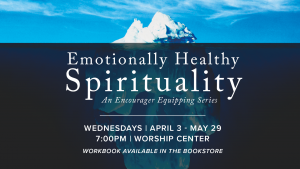 This class meets weekly on Fridays from 10 a.m. – 12 p.m. in Room O upstairs near the Youth Room. Please bring your own painting supplies, easels are provided. 10 pc. Set of Paints – (Master’s touch brand available @ Hobby Lobby contains; Titanium White*, Yellow Medium, Permanent Red, Phthalo Blue, Grass Green, Burnt Umber, Crimson, Ultramarine Blue, Yellow Ochre, Permanent Black. Michael’s and Hobby Lobby have various sizes in multiple packs. These are on sale regularly.